The carrot/potato cheese phenomenon seems to be taking the vegan world by storm – and for good reason – it’s healthy, it’s creamy, and it taste like cheese! Well ok – maybe not exactly like cheese…..
What I tell new people is it depends on how long ago it’s been since you’ve had real cheese. If it’s been just recently – then it may not compare. But if it’s been a while – the resemblance will be so close you won’t even notice. You’ll just be like ….CHEESE…nom nom nom…… Oh this is SO GOOD nom nom nom…. But if carrots in your cheese just doesn’t sound appetizing – there’s another healthy vegetable with that same orange appearance as carrots (and cheese), that is absolutely loaded with healthy vitamins and starches…. Yep – the Sweet Potato. And these babies make a pretty mean cheese sauce too. So why sweet potatoes you ask? Well besides the fact they’re naturally orange like cheese, there’s also this little thing called nutrition – as in they are one of the most nutritious foods on the planet. Sweet Potatoes are packed with calcium, potassium, magnesium, and Vitamins A, B6, C, and even Vitamin D. Plus as an added bonus, they also contain iron and have fewer calories than the regular potato. So eat up. Sweet potatoes are good for you. And when you add a few spices to make them taste like cheese – I almost feel like I’m cheating as I can have the best of both worlds – nutrition AND cheese. Back in my younger days – gorging on the Standard American Diet – I can’t tell you how many Sundays I spent with my buds, watching Football, and chowing on the infamous dip made from Rotel Tomatos and Velveeta Cheese. If you’ve never heard of it, it’s a cheesy concoction made in a crock pot where you basically add a whole tub of Velveeta Cheese, a can of Rotel Tomatoes with Green Chiles, and a whole tube of cooked Jimmy Dean Pork Sausage, and heat it until it becomes all melted and gooey. I know – NOT healthy. And let’s not even get started on the indigestion, or the bloating, or the gas….. In this recipe, I wanted to try and re-create those amazing flavors – but do it in a healthier way. So I decided to use a Sweet Potato for the basic cheese sauce, and to capture some of that zing from the original dip I added a can of Rotel Tomatoes. Naturally, if you want less zing in your dip, you can easily leave out the Rotel and substitute some Sriracha or Tabasco, but I really like the green chile flavor the Rotel adds. This recipe is pretty basic – peel and chop up a sweet potato (yep – I used just one), toss it in a pan of cold water and boil it until it’s soft – about 20 minutes. Then transfer it to a blender with some liquid and spices, and press the button. Within a minute or so – right before your eyes – cheesy magic happens. Add in your Rotel, or Sriracha, or Jalapeños, or Green Onions, and stir. Use this a sauce for nachos, a sandwich spread, bean and cheese burritos, or even as a baked potato topper. 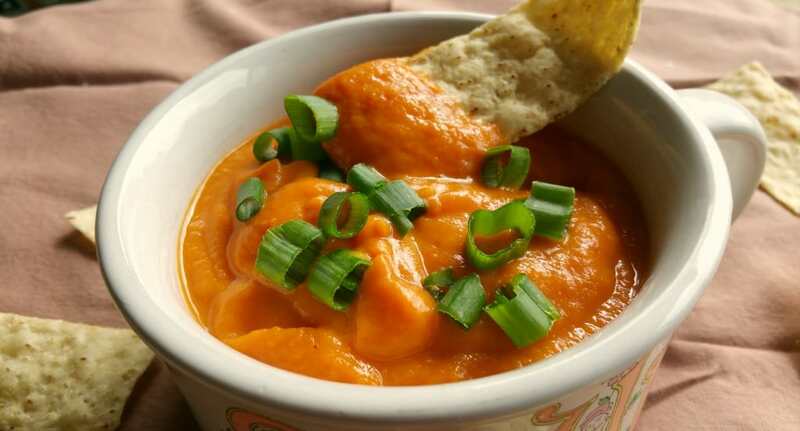 A nacho cheese dip made from sweet potatoes and spices. Super easy and super nutritious. Stir in tomatoes or other garnish and serve. Garnish with Green Onions or Jalapeños. Serve with Chips, as a Nacho Sauce, with some refried beans in a Burrito, or even as a Baked Potato topper. Tried this. It is ok. Tastes more like tomato soup with cheese. Unbelievable! Sure had my husband fooled and he loved it! When I told him what it was made of, he eagerly ate more of it, without the guilt. Deeelicous! !